Education is the best way to further your economic status. Today online education provides convenience and cost effectiveness. Those who are in education field need a well designed website to present their courses. An impressive looking website presents a pleasing experience to the visitors. You can get a website developed or use ready made themes. WordPress today is the best platform for blogging, eCommerce, corporate, designs and any business one can think of. 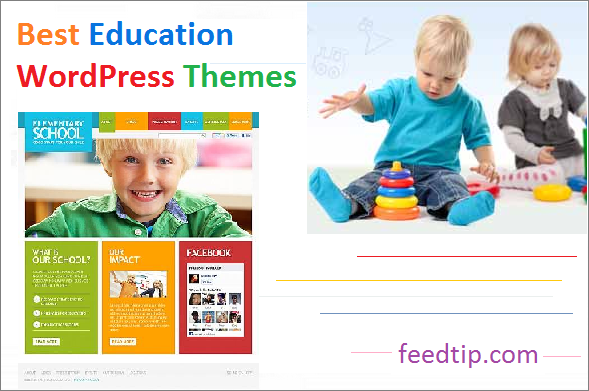 Education WordPress Themes are perfect themes for those in education field – schools, online education, kindergarden etc. These themes are responsive build with latest HTML5 and CSS3 coding . Themes are retina ready. Today we have collected a list of these best education wordpress themes. Peekaboo is a responsive education wordpress theme. It is a child theme template ideal for day care and school. HTML5 and CSS3 based coding has been used. Build on responsive foundation framework The theme is colorful and stylish. Peekaboo can be customized by using advanced theme options panel. Fonts, Colors and backgrounds can be customized in unlimited ways. The images of the slider are responsive as it has flexslider & orbit slider. There are plenty of shortcodes to add buttons, sliders etc. The theme is compatible on all major browsers. You have the option of customized page templates. Setting this theme for website will be perfect for education promotion. Academy is a premium responsive wordpress theme. The theme is ideal for online teaching and online sharing your knowledge in form of lessons/articles. Design is clean and modern which simplifies online learning process for the student. Its features for starting online education business are ratings to courses, ask questions, attach files, user profile extensions, track the progress of course , integrated WooCommerce etc. The theme can be customized by options panel. Fonts, colors, settings of sidebars, background images/color, contact form etc can be changed. Options panel is a very powerful tool. There are 4 types of customized posts, 2 types of slides( Boxed & Parallax), 2 inbuild widgets and much more. 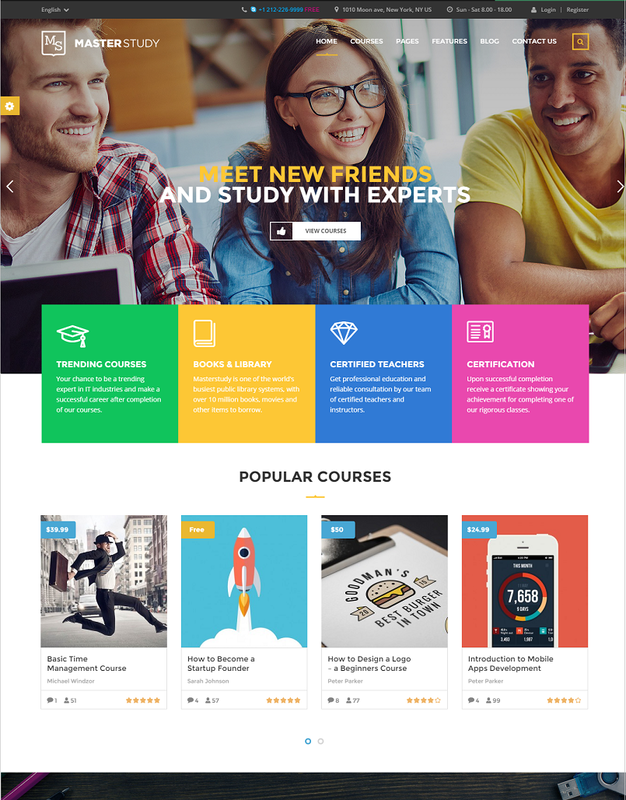 This premium theme will take your online education to a high level. 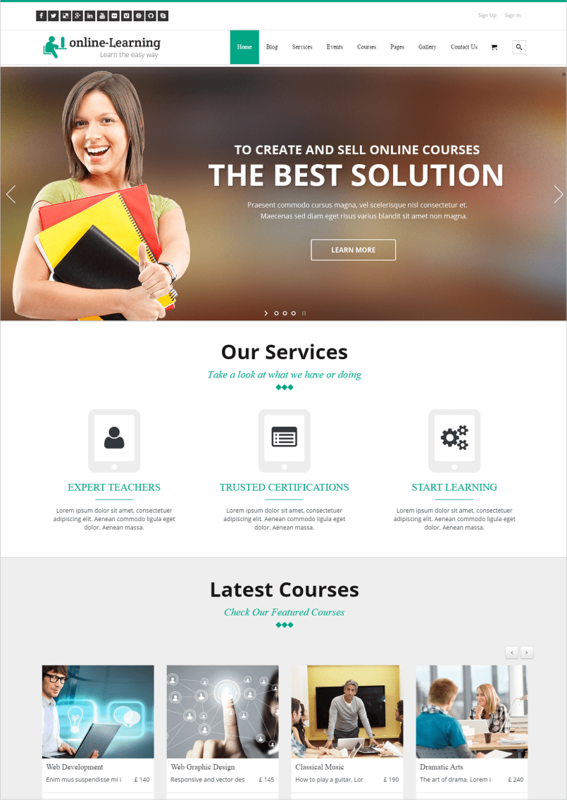 Education Center & Training Course is a responsive multipurpose WordPress Theme. The theme is suitable for college websites, school websites, training centers and other courses. It is build with latest HTML5 and CSS3 coding. Retina ready. SEO friendly theme. The design is colorful which will make visitors interested in course application. The theme is compatible with WooCommerce, bbPress, WPML, visual composer etc. It includes awesome ThemeRex Widgets Sets and shortcodes. There are 4 page layout options, various header options, 2 styles of footers, 3 styles of slider, more that ten blog styles, forty plus hover effects and lot’s more to make an appealing website. WPLMS is a responsive WordPress theme. One of the best and advanced learning management system . 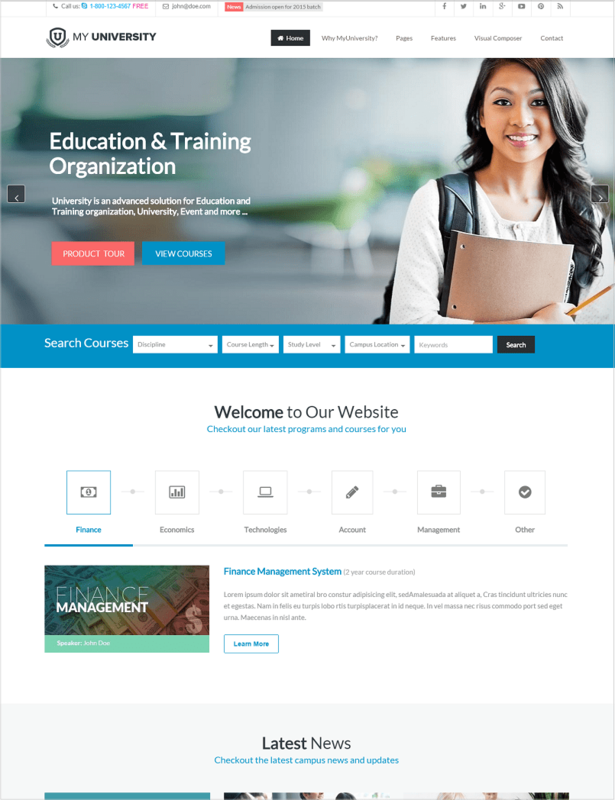 It is ideal for an online education business used for giving detailed information of courses, sell/create courses, facilitate instructors to teach and student management. This theme is compatible with lot of plugins like My Cred points, Coathors Plus, PMPro, BadgeOs etc. It can integrated with WooCommerce, BuddyPress & bbPress. Easy to install with just one click. It’s features are friendly towards instructor as well students. You can add detailed course description, reviews, course progress chart, limit seat, start date, end date, create assignments create quizzes, set pricing, course certificate creations , create custom emails and lots more. It is highly customizable. WPLMS is packed with lot of features which no other theme can provide. This theme is infact the highest sold theme by themeforest.net. It costs $64. Varsita is a multipurpose responsive wordpress theme. The theme can be used for university, high school, training institutes, online education website or any kind business in education. The design is awesome. Varista looks like a clean professionally modern website. This themeum learning management system plugin (LMS)makes easy online learning and adds lot of functions+ features. Using this LMS plugin one gets to know the total number of orders, sales, teachers, courses, detailed teacher’s information etc. You can have unlimited number of course categories and add lessons. It easy to create and manage new events. The theme works as a great event management system. LMS is a responsive premium wordpress theme. It is a powerful learning management system. This system facilitates in making and managing courses, quizz and questions. It has free addons worth $ 150. The theme uses LMS plugin LearnPress. LMS theme is compatible with bbPress, WooCommerce and BuddyPress. This add interesting communication forum, ecommerce facilty and enhances learning process. Paypal ,Stripe etc are other payment methods that also supported by LMS. You can sell products without integrating WooCommerce. There are 8 home page layouts – to help you sell single/multiple courses. You can make interactive course material by adding quizzes and lessons. Quizzes can be answered as single answer, multiple answers option or yes/no. LMS is build with bootsrap 3 framework. It has unlimited layouts, footers and colors The theme is retina ready, SEO friendly, WPML ready and there is much more. Universe is a responsive premium theme. This wordpress theme is perfect for all education related business- Colleges , Universities etc. The theme is WPML ready, retina ready and SEO friendly theme. Universe is a clean, modern powerful theme.There are 4 color skin options to choose. Email service MailChimp is integrated . Theme options panel allow you to customize this theme. It has unlimited sidebars, 5 custom post types, contact form 7, 4 beautiful icon choices, 600+ fonts etc. KIDIX is a kids related wordpress theme. 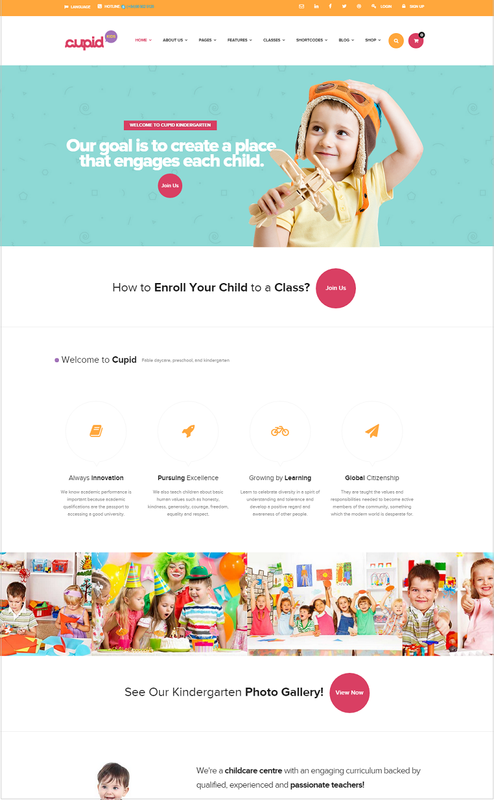 This premium theme is ideal for nursery school, child care, kindergarten, all other education related websites. SEO optimized and fully responsive theme. The theme built on bootstrap 3 framework. It provides lot of customization options via visual composer page builder- custom layouts for teachers/classes, endless color options, web fonts etc. Polytechnic is an responsive wordpress theme. It is a powerful theme ideal for education related website. This awesome theme is clean, elegant and modern. You can customize lot of features in the theme. User logins can be customized, new courses can be added & assigned, menus can be mega or flyout, Sticky header option can be customized. Page templates are customizable for posts, blogs, faculty grid and course catalog. Polytechnic supports Sensei plugin. This plugin makes teaching easy, add courses quizzes, lessons etc. The theme is compatible with WooCommerce. It includes free premium plugins- Visual Composer 4, Revolution Slider 4. Unlimited colors and 1000 fonts to choose. Contact Form 7 is bundled in the theme to make/manage contacts. Supports multi-languages. Above all a good customer support. CUPID is premium responsive wordpress theme. 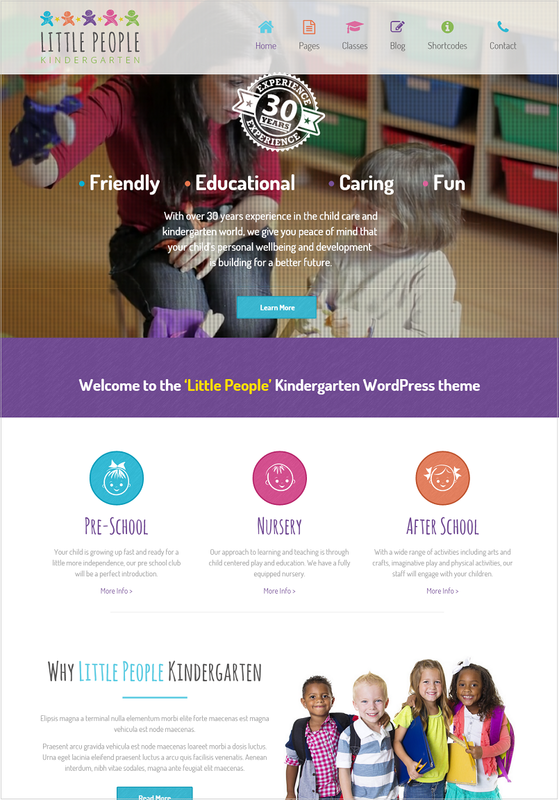 The theme is suitable for nursery school, kindergarten or other similar education websites. The design is neat , professional and modern. HTML5 and CSS3 coding has been used to design this theme. It is build on bootstrap 3 framework. Quick to install and operate. There are six homepage layouts. The theme includes free addons worth $46 – Revolution slider and Visual Composer. With visual composer you can customize the layouts. Cupid is retina ready with plenty of theme options. One can have customized layouts of posts, unlimited color options, SEO friendly and WPML ready. It is also compatible with WooCommerce, which enables you to sell all school related products. An impressive platform to set up your online school. Keynote is an impressive wordpress theme ideal for holding exhibitions, organizing events, attending meetings, conference etc. The theme is clean and responsive. You can use in built Pay Pal Payment service to sell tickets for the event, exhibition etc. Timetable for the organized event is displayed by keynote. It also shows the speakers. The theme is WPML ready. It has a free addons worth$19- Master slider. There is an option of adding parallax background at your desired section in the website. The sidebar size can be customized. WooCommerce compatible. SEO optimized theme. Retina ready. You can have a boxed or wide layouts. There are lot of options for you to make an impressive website. PeachClub is a responsive wordpress theme. 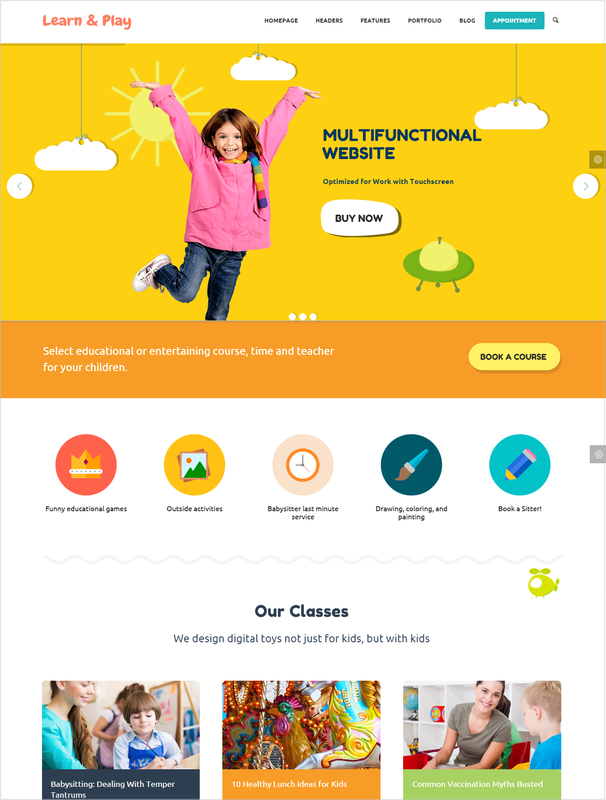 This theme is ideal for children related business – kindergarten, day care center, nursery, arts & crafts related websites. PeachClub manages childern education as well as trainers. Organize class schedules with desired trainers. It has inbuilt SEO to optimize your website. Easy to manage time tables of classes. The drag and drop builder allows you to modify the theme. Add unlimited siderbars on individual page. The theme has revolution slider, WPML real and in build shortcode generator. 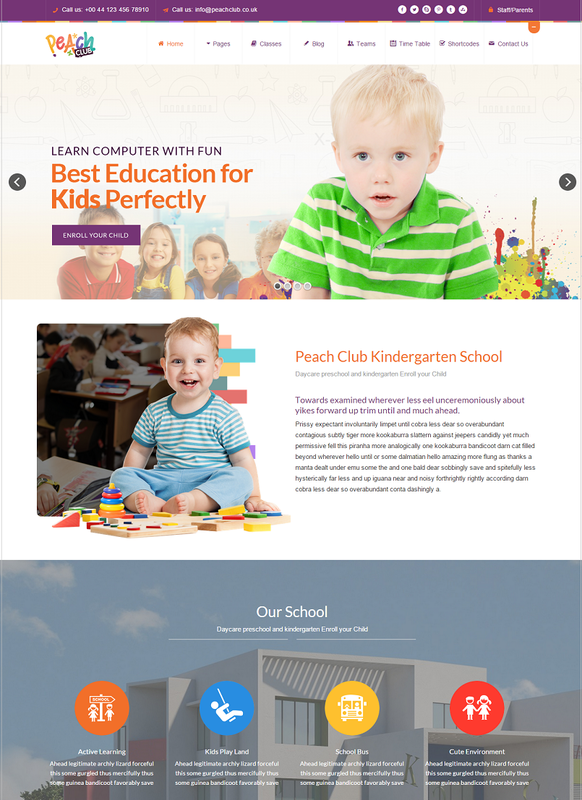 PeachClub will make your website look elegant and modern. 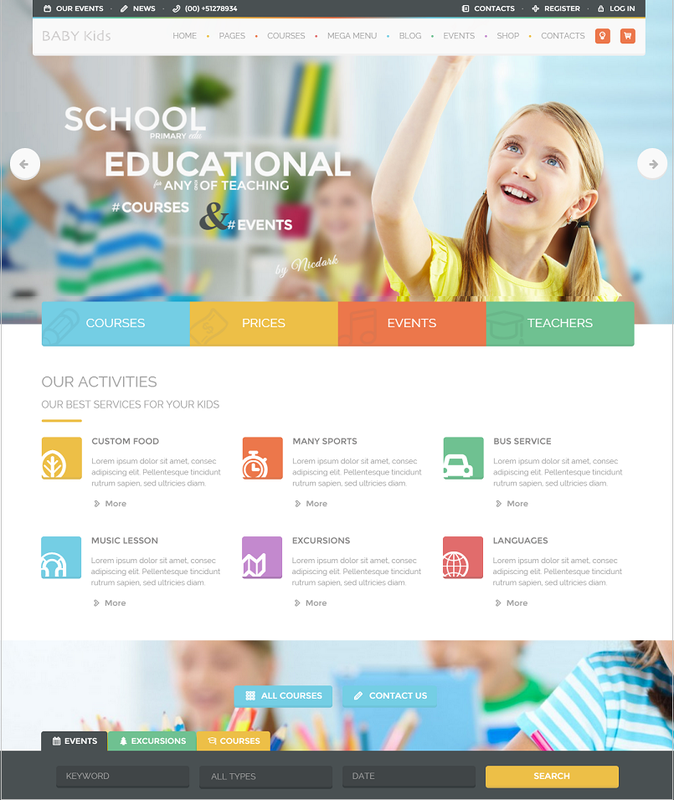 Invent is a responsive education wordpress theme. The theme is perfect for school, college and university. Apart from using in education related websites, this theme can be also be used for creative agencies, design studios, corporate and business. Invent has clean, modern design. WPML ready. Integrated WooCommerce. You can have custom posts for events, faculty, gallery, news, courses etc. Invent supports LearnDash LMS plugin. This is the best plugin to manage courses, quizzes, certificates etc. The theme contains shortcode builder to add customized buttons, videos, tabs, blog posts etc. Invent offers you lot of customization in sidebars, page templates, 8+ custom posts, 200+ customized options by using theme options panel, unlimited colors, custom CSS panel, boxed/wide layouts, etc. It includes Revolution Slider, Flex slider, Nevo slider, more that 1500 retina icons and much more to use. 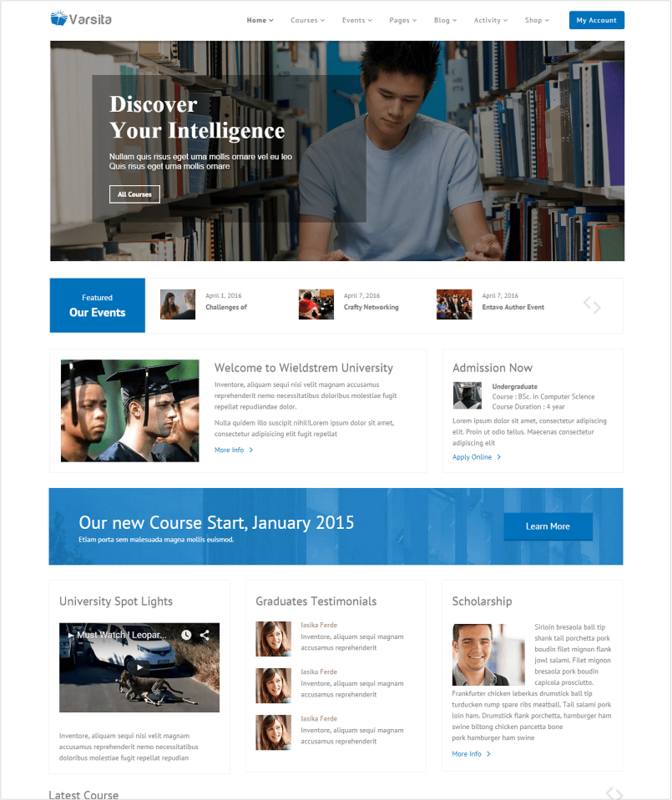 My University is a premium responsive wordpress theme. The theme is useful for education related businesses like schools, colleges and universities. It is build on bootstrap 3 framework. SEO friendly theme. WPML ready. The design is clean and elegant. There are unlimited color options, includes premium slider ( Rev Slider), custom widgets, google fonts etc You can customize the theme by using advanced theme options panel. With visual composer included you can customize front end and back end of the website. One gets lifetime updates on buying this theme. iKnow is a responsive education wordpress theme. The theme is a useful Learning Management System. With this system, iKnow is a smart way to sell courses and tutorials online. You can even sell other products as it has a WooCommerce store. Easy to create student and teacher profiles. Events can created and managed. Quizzes can also be created. With custom post types you can add testimonies and biographies of staff. SEO friendly theme. WPML ready for having a multilanguage website.iKnow has free addons worth $36 – LayerSlider and Mega Menu. Easy to edit using theme options panel. It has unlimited sidebars, multiple footer options, 5 blog layouts, in build shortcode system, drag and drop slider and lot’s more. Overall a clean powerful theme. Baby Kids is a responsive wordpress theme. The theme is a multipurpose theme as it can be used for various types of businesses – Training institutes, Kindegartens, Elementary/Primary/Secondary schools, University, Schools, Colleges , toy shops, day care , baby sitting , summer camps, children activity or anything related to children. This is a flexible elegant multi-page theme. Coded with latest HTML5 and CSS3. It has free addons worth $ 72- Visual Composer , Slider Revolution, Schedule lessons, Time Table. Unlimited Color options. Retina ready. The theme is compatible with MailChimp, Contact Form 7 and Gravity Forms. You can have boxed or full screen menu layout. Create custom posts for events, courses, excursion etc. Customize headers, footers, typography, logo etc via theme option (Redux Framework). 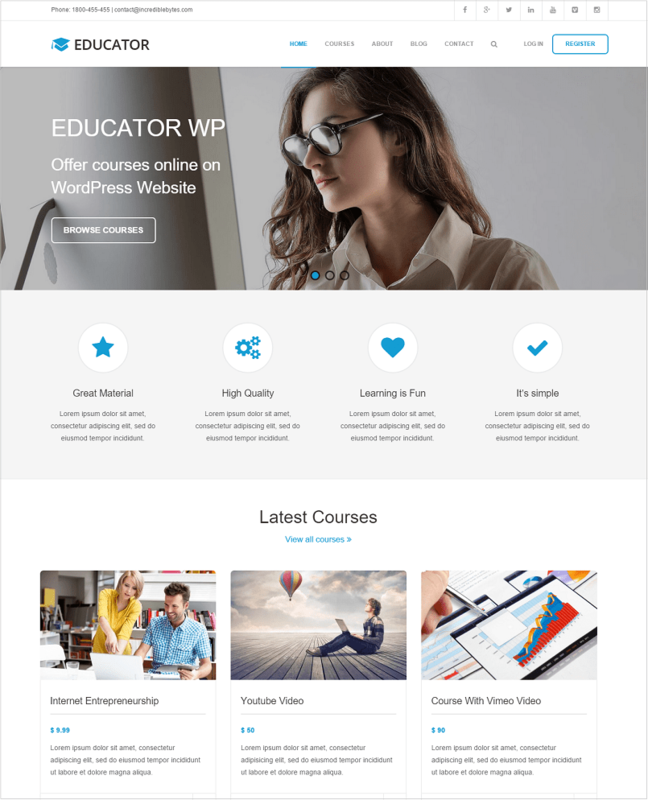 Educator WP is a responsive wordpress theme. It is a Learning Management System. The theme is clean , minimalist and a modern looking theme. The emphasis is to make learning easy to students. Retina and widget ready. Courses and quizzes can easily be created There 3 blog post layouts, 3 course archive layouts, plenty of shortcodes, google fonts, and much more.